Previous post: Handwoven article, and finished scarf! This time, following a discussion on WeaveTech, I decided to wind two sectional-beam-sections’ worth at once on my AVL warping wheel, and wind them on simultaneously.Â My first few attempts resulted in uneven tension (looser in the center than on the edges), but fortunately this was a short warp, only 7 yards, so I don’t expect the minor tension differences to cause major problems.Â And by the time I wound the sixth and final bout, I had managed to get the tension perfectly even across both sections.Â This will save me a lot of time and fuss in tying off the cross – only half as many bouts to tie and untie!Â I’m going to have to practice some more before I try it on a really long warp, but I’m thrilled with the results so far. 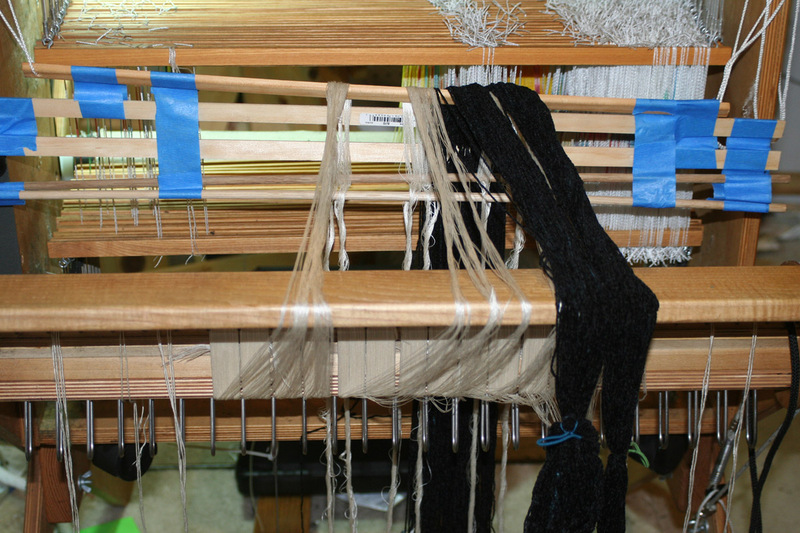 This warp is 3000 ypp rayon chenille as the thick threads in both warp and weft.Â The thin threads will be 60/2 silk again, and this time I plan to sett it at 36 epi and see what happens.Â I’m also washing the weft thread before weaving.Â I suspect one of the reasons I got way more shrinkage crosswise than lengthwise last time was that I had dyed the warp before warping up, shrinking the yarn into its relaxed position, so it didn’t shrink a whole lot more when washed.Â But the weft was used straight off the cone! so would naturally shrink once washed. I am hoping that by prewashing the weft I can reduce the crosswise shrinkage.Â I don’t care as much about lengthwise shrinkage, since I can always weave it longer, but I can’t weave it any wider than my 24″ loom permits!Â So I’m doing everything I can to minimize crosswise shrinkage. All that said, I’m not doing any weaving for awhile, as we’ll be traveling for the next week or two, visiting family.Â I had planned to bring the Knitter’s Loom along, but have realized that it really only fits in a full-sized suitcase, and we’re traveling relatively light.Â I do have a Mirrix Little Guy loom, but I’m not really in the mood for tapestry.Â So I have knitting needles, three balls of Mini Mochi sock yarn, and a really neat sock pattern that involves a bunch of hexagons attached together, miraculously manifesting as a sock.Â Me being me, of course, I must try anything that looks that exotic. And, I have to dig out last year’s hat, so my ears don’t get cold.Â Perhaps it is time to knit another Funky Hat?